ALBUQUERQUE, NM - The 11th installment of Holidays Take Flight at the Anderson-Abruzzo Albuquerque International Balloon Museum includes some new offerings while bringing back some of the favorites. 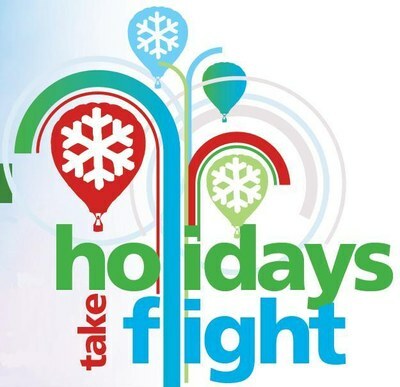 Holidays Take Flight is on Su nday, Dec. 3 from 11 a.m. to 3 p.m. The event is free. Activities include a meet and greet with Balloon Pilot Santa, cookie decorating, card and ornament making, as well as sing-alongs, live performances by the Enchantment Handbell Ensemble and caroling by both the Volcano Vista High School and Manzano High School choirs. During the day, attendees can explore "Balloon Snowland," watch the Balloon Museum&apos;s radio-controlled balloon fly on the North Grounds (weather permitting) and purchase special holiday-themed food and delicious hot chocolate from Loretta&apos;s Lattes Gourmet Food Truck. New to this year&apos;s lineup is a living sculpture with dancers from On Display Albuquerque, a local installation of On Display Global, a movement marking the International Day of Persons with Disabilities designed to celebrate diversity, beauty, and acceptance. Dancers of all abilities dressed in white will perform in and around the Balloon Museum. Also new this year is "Weather School in The Weather Lab," ideal for those curious about winter and weather in general. Meteorologists from the Albuquerque Office of the National Weather Service will host hands-on activities and demonstrations related to weather. Weather safety guidelines and forecast information will also be included. Holidays Take Flight is an annual celebration and drop off spot for Toys for Tots. Those who wish to do so may bring new, unwrapped toys and games that will then be presented to the Marines at 12:30 p.m.
Named in honor of Albuquerque&apos;s pioneering aeronauts Maxie Anderson and Ben Abruzzo, the Balloon Museum opened in 2005 and has since welcomed over one million visitors from across New Mexico, the United States, and around the world. Through its extensive collection of artifacts, interactive special exhibitions, and engaging educational programs, the Museum is a gateway to science, exploration, and discovery. The Museum is open year-round and hosts many community-oriented special events, features unique art and architecture, and offers distinctive rental spaces for meetings, weddings and receptions, and other celebrations.